I was surprised to find no marker earlier than 1982 here. Given the location and extrance I was expecting some more plots for individuals laid to rest here long before the nearby dam was built. Traffic noise from 620 is a constant companion, but there's a nice view of the Hill Country off the back of the property. 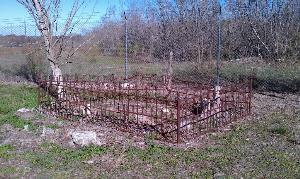 This is one of the smallest cemeteries you'll likely encouter with only four plots. Stopped by to log the visit since I'd failed to do so when I documented some time back. I knew that there was a cemetery at the northern tip of ABIA, but thought that the gates to it were closed except for family members. I decided to take a closer look after hiking at McKinney Falls State Park. There are some interesting headstones here and it's surprising quiet and tranquil most of the time when planes are not taking off overhead.